Lena Abhilash will be seen as bike rider Sachins in Aaru Sundarimarude Katha(ASK) malayalam movie directed by debutant Rajesh K Abraham. Produced by A.V. Anoop, the movie features Umang Jain, Nadia Moidu, Shamna Kasim, Lakshmi Rai, Zarina Wahab, Prathap K. Pothan and Narain in prominent roles. Deepak Dev would set the tunes for ASK while Sameer Haq wields the camera. Lena Abhilash who has donned a variety of characters is yet again on the way to win the hearts of the movie lovers. This time the actress would play the role of 'Sachins', a specialist bike rider who decides to revolve around the world in Aaru Sundarimarude Katha(ASK) directed by debutant Rajesh K Abraham. 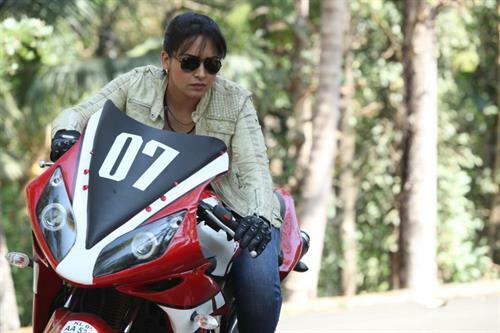 Her motor bike expedition was shot at various locations in Kochi. To give perfection to the character, Lena took time to learn riding the bike. Having a peculiar character Sachins is being introduced through a channel programme. But Sachins did have a hidden agenda which gets unveiled in the next phase of the story. As the title suggests, Aaru Sundarimarude Katha(ASK) is the story of six beautiful women. As they bond together, their destinies affect each other while a murder of one among these women shapes the rest of movie. When the movie starts, Chachi (Zarina Wahab) introduces the six beauties along with their male pairs. Chachi is, a 70 year old grandma who lives in a bungalow in Vagamon. The other members of her family are settled in Thiruvananthapuram with high position in Indianet TV, the number one TV channel in Kerala. Rose (Nadia Moidu) is her daughter; Alex (Prathap Pothen) is her son-in-law who is the Chief Executive Officer (CEO) of the channel while Anju (Umang Jain) is her granddaughter. Rose is a retired national basketball player while Anju is a growing Tennis star who is having huge fan followers. Alex who is well associated with the television channel focuses on programs for the entertainment of women while he does entertain many women in his life too. As the relationships are being reveled through Facebook, the family relationship get crack. Rose tries to find comfort in hands of her old friend Sree (Narain) who brings back basketball into life. Chachi works out plans to unite Alex and Rose. Alex wins a global media award in Singapore whole Rose opens 'Rose Academy' of Basket Ball. Anju prepares herself to play the climax game. A rival TV channel anchor Ria accuses Alex of sexually harassing her and carried the tapes to be presented at the Singapore award function. With Ria found dead, the story enters another phase which makes the movie more interesting. Fausia Hassan (Lakshmi Rai) and Meena (Sahma Kasim) are the other lead characters in the movie. Produced by A.V. Anoop, the movie is blessed with the presence of Deepak Dev who has set the tunes while Sameer Haq had zoomed the camera capturing the scenes at its best. Lena Abhilash has a handful of movies in kitty with Left Right Left, Tourist Home, Thomson Villa, Kanyaka Talkies and White Paper.